$60 Unlimited Broadband - no strings! Forums › Slingshot and CallPlus › $60 Unlimited Broadband - no strings! thats probably if you buy it *with* the homeline.? i assume the 12 months relates to the homeline bit, not the broadband unlimited bit. The $149 is only for broadband termination, homeline termination is an extra $50. 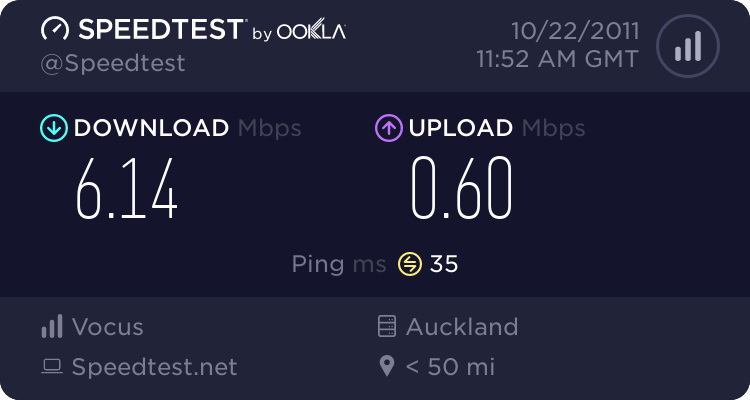 http://www.slingshot.co.nz/internet has the line "Broadband UNLIMITED costs $60 per month regardless of whether you have your landline with Slingshot or another provider." Not sure if that includes having tolls with Slingshot or if that will be an extra charge. 1. Some of the content on the web site is not accurate and this has been sent to marketing for correction first thing Tuesday. Apologies and thanks for highlighting. 2. 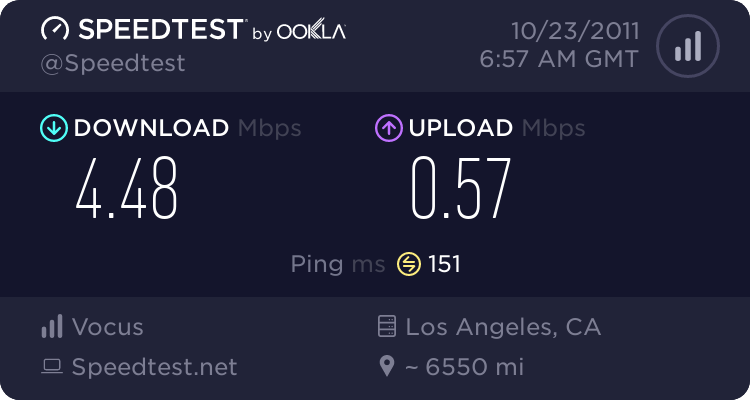 I can assure you the offer is $60 unlimited broadband with no contract - you need to have an existing Homeline, but this does not need to be with Slingshot. 3. If you do move your Homeline to Slingshot it will cost between $41-$51 depending on where you live. There will be no contract on the Homeline either for customers that choose this option. 4. All advertising will make it clear that a Homeline is required and that customers need an existing modem - this offer is clearly targeting existing broadband users. 5. This is not misleading advertising, the offer represented is accurate. There are no hidden costs and Slingshot is not requiring you to move your Homeline or calling. As you're aware, excluding Naked Broadband customers all broadband users in NZ must have a Homeline. While I appreciate the concerns in relation to the quality of the service, as stated there has been significant investment in this area. Our confidence in the performnace is reflected in offering no contracts. AdrianD: Thanks for your feedback. No contract is a significant improvement on previous slingshot offerings. I have stuck with slingshot for a few years now, and was disappointed that previous plans involved new contracts for existing customers. I disagree with your point about homelines because my current plan has it bundled but thanks for ensuring that its clear in future advertising -- i don't pay separately for slingshot homeline and i thought UBA plans (naked DSL) could now be provisioned with or without POTS instead of homeline being a prerequisite. Can you advise if there is a naked DSL equivalent to this plan without homeline? I find iTalk works quite ok and been thinking to port my landline number to a second VoIP service. Regs: Really, you should be applauding this company for persisting to offer and improve a service that everybody seems to want, yet most other companies have run away from providing ..
As long as they dont promise a "better place" that often isn't delivered on. Can't use Telecom as an excuse for terrible peak time speeds because I'm on "Next Big Thing" which is unbundled. I do have to applaud Slingshot as being the masters of mass marketing, and I wish I could think up brilliant marketing campaigns like that. Unfortunately that creates high expectations. Sorry freitasm, thats a good point although advertising has to be responsible too. I should still give him a break being a first time poster. AdrianD: While I appreciate the concerns in relation to the quality of the service, as stated there has been significant investment in this area. Our confidence in the performnace is reflected in offering no contracts. Thanks for your update. Appreciate having official Slingshot staff on here. Ok, so can you turn my current slingshot naked connection into this deal with a promise of zero downtime? I realize you will have to add some PSTN to the line but that should be able to be done without messing with the data services provided from the cabinet, and as I wont be using it there will be no need for me to do anything at this end. I'll give it a go. I signed up but I may have trouble with having my current homeline account separate. P1n3apqlExpr3ss: So for clarification, its $60 for the broadband only and you can keep your current homeline and tolls or switch over to slingshot if you wish to? "Double the International bandwidth of the first All You Can Eat plan." How does one explain that though? And as always, cached torrents come down at 500kB/s+ anytime, usually faster after 3am. 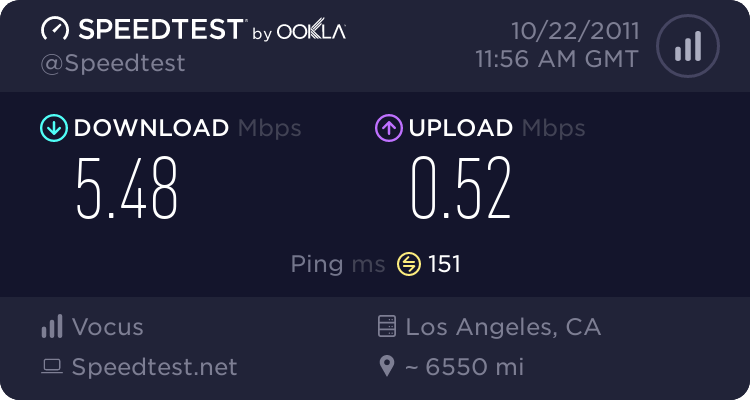 FTP Speedtests to LA servers: 3-4 Mbps. The two options they have put the ball squarely in their court. With direct credit, you are at the mercy of the customer to pay you on time. Hold on a tick, Naked BB is BB without a phone line, your plans look as though they need a PHONE LINE connection in order to use your plans. You need to clearly stipulate this and outline this is NOT naked at all. I'm failing to see how people are getting so easily confused. It says an existing homeline is required, no where does it say it needs to be with Slingshot, or this plan being naked broadband. I might try this out for a month or two seeing as there's no early termination fee. How soon can you cancel if your not happy with it? Within a week? Or do you have to wait until the end of the month?